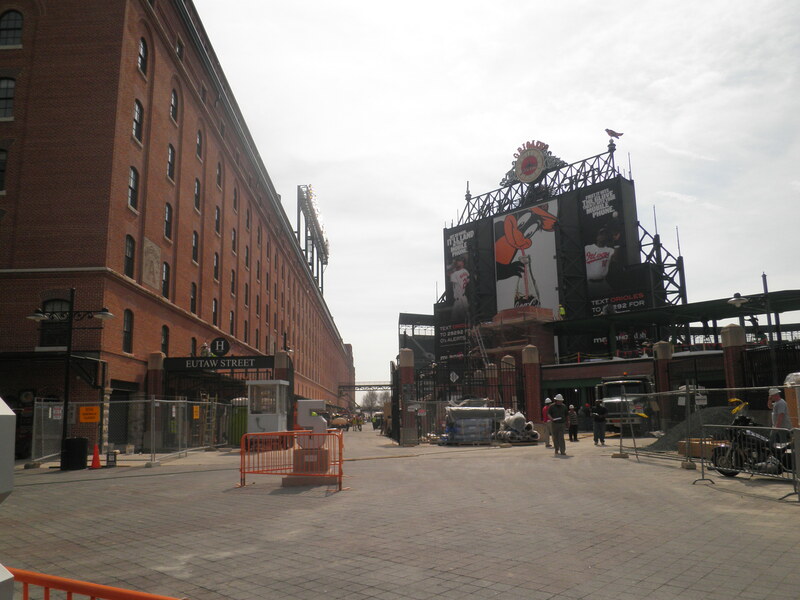 With less than a month until Opening Day on April 6th, we re-visited Camden Yards to see the improvements and modifications that have been made to the stadium. Over a month ago, we highlighted the renovations that were starting to take place this off season at Camden Yards to make Oriole Park more of a year-round facility. These improvements were designed to coincide with the celebration of 20 years at Camden Yards for the Orioles. Along Eutaw Street, all of the scaffolding has been brought down as a sign that the restoration of the bricks of the Warehouse is complete. The new restaurant that is being added along Eutaw Street is also nearing completion. There is a green awning over the restaurant area, which used to be the staging area for the TV cameras. This new area will feature a bar and year-round dining. Meanwhile, the picnic area and flag court are still in development. New landscaping will be placed in the picnic area as well six statues of Oriole greats: Cal Ripken Jr., Eddie Murray, Brooks Robinson, Frank Robinson, Jim Palmer and Earl Weaver. Throughout the season, each statue will be unveiled. Other minor touches to the Warehouse and Camden Yards are in their final stages of completion. The season is quickly approaching and construction crews are hard at work helping Oriole Park maintain its status as one of the gems in MLB. Be sure to check back in as we make more visits to Oriole Park in the weeks leading up to Opening Day on April 6th against the Minnesota Twins.